Ever Felt Like Running Away to The Circus? The circus has come to town and if you are brave enough you could be part of it. 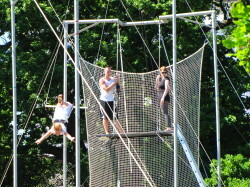 Gorilla Circus launched in summer 2009 aims to bring flying trapeze classes to ordinary members of the public. The school is one of only two flying trapezes in the UK that are open to the general public, and the only circus school in London that takes place outdoors. 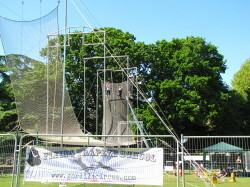 For this week and next Gorilla Circus has taken up residence in Walpole Park and offering flying trapeze classes for anyone who ever dreamed of fulfilling their ambitions of flying through the air.